The Health Information Security Framework is designed to support health and disability sector organisations and practitioners holding personally identifiable health information to improve and manage the security of that information. The updated Health Information Security Framework references and is consistent with AS/NZS ISO/IEC 27001:2013; the New Zealand Information Security Manual; the New Zealand Government Risk Assessment Process: Information Security, and the New Zealand Government Protective Security Requirements. Ministry of Health. 2015. 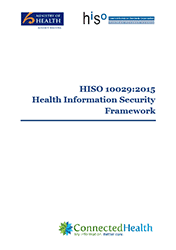 HISO 10029:2015 Health Information Security Framework. Wellington: Ministry of Health.